This Sunday we’ll be reading Mark 1:9-13, which becomes a sort of cosmic “good news/bad news” scenario. It’s not really bad news, but it’s a strange juxtaposition of a glorious moment immediately followed by a time of hardship. Life has a way of following that pattern though. As you may recall, the theme of Mark’s gospel is the declaration that Jesus is the Messiah – the Divine King and His conquest. What a Divine King’s conquest looks like is something we may picture a certain way, which Mark works to dismantle. As soon as Jesus appears in our text, he does something very strange indeed. He is baptized by John. 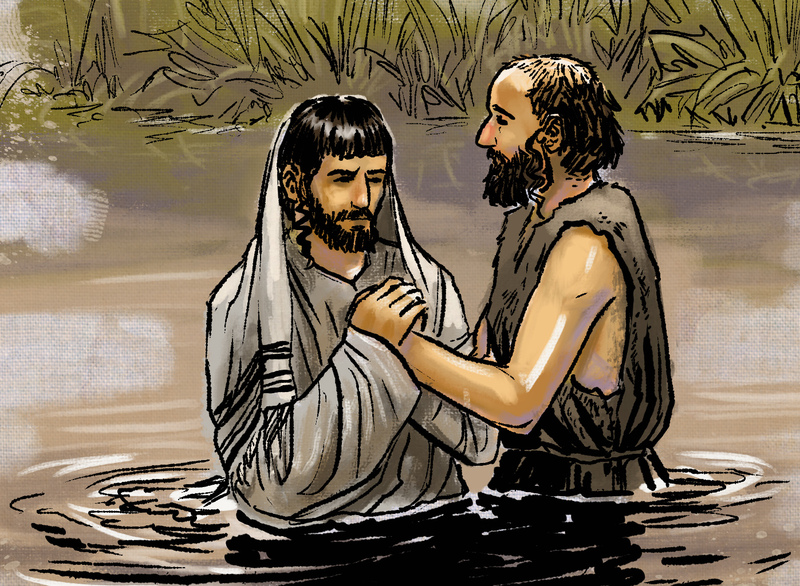 Baptism was the ritual John was calling the people to submit to as a demonstration of their repentance and renewal in God. Why do you think Jesus took his turn with all the other people there and underwent this ritual? What does it tell us about the nature of this Divine King? After his baptism, the fabric of reality is torn open and a glimpse is given to God’s reality – and from that reality (heaven) the Holy Spirit descends on Jesus and God’s voice speaks calling Jesus His beloved Son. This is a passage that gives a tantalizing glance at the mystery of God’s Triune nature. How do you see three distinct Divine personalities and actions in this passage? Jesus, as Messiah, stands as representative of all the human race. He entered our condition in order to bring us into His condition. What is true of Jesus is true of those who believe in and follow Him. What do you believe the Father declares about you? Can you imagine God saying to you: “You are my Child, whom I love; with you I am well pleased.” Let that run through your mind, and put your own name in that sentence. What is your reaction to that? Right on the heels of that amazing experience, Jesus is pushed out into the desert to face the struggles of temptation. As I said, good news/bad news. Mark is very brief in his description, but we get enough of the picture of the devil and wild beasts that we know this was no comfortable spa retreat Jesus went to. How do you think the previous experience at His baptism prepared Jesus for this part of his journey? What sort of “spiritual desert experiences” have you had in your life of following Christ? What, if anything, did you learn from them?